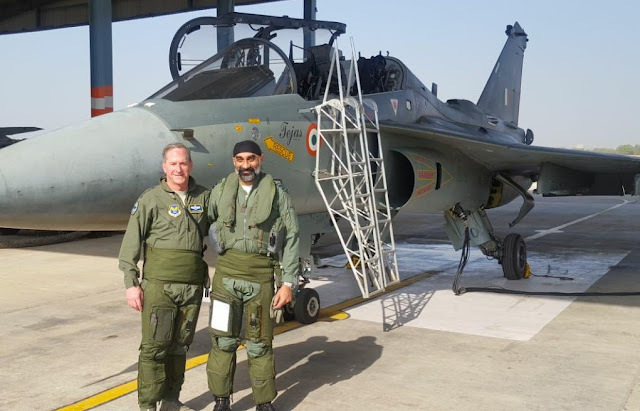 U.S. Air Force Chief of Staff, General David L Goldfein flew a sortie in India's homegrown Tejas light combat aircraft today. The flight is seen as a major endorsement for the single engine fighter aircraft that has been in the making for around three decades. He flew from the Jodhpur airbase in Rajasthan, a frontline base close to Pakistan border, along with Indian Air Force Air Vice Marshal A P Singh. The duo flew in the two seat trainer version of the Tejas for around 30 minutes. Powered by GE F404 turbofan engine, the delta winged Tejas is a fourth generation light fighter jet developed to replace the large no of MiG-21 fighters operated by Indian Air Force. IAF started receiving the Initial Operational Clearance (IOC) configuration Tejas in 2016 and six aircraft are in fleet. Order for 20 IOC configured and 20 Final Operational Clearance (FOC) configured Tejas has been placed with Hindustan Aeronautics Ltd.
Tejas is expected to achieve FOC in June 2018, after multiple delays. The configuration will add aerial refueling, higher angle of attack, Beyond Visual Range air to air missile capability and a internal canon to the aircraft. A Further order for 83 Mark 1A variants featuring AESA radar, optimized maintenance, Electronic Warfare capability, On board Oxygen Generating System (OBOGS) and reduced weight have also been cleared for production at an estimated cost of USD 7.5 billion. Goldfein is a command pilot with 4,200 flying hours, having flown in combat missions in operations during the Gulf War, Afghanistan and the erstwhile Yugoslavia. In 1999, Goldfein's F-16 was shot down over western Serbia by a S-125 surface-to-air missile fired by Yugoslav Air Force. He was subsequently rescued by NATO helicopters. AVM AP Singh is the Principal Director Test Flight at the National Flight Test Center (NFTC), which heads the flight testing of the Tejas. He has flown over 4700 hours, flying more than 30 different aircraft.